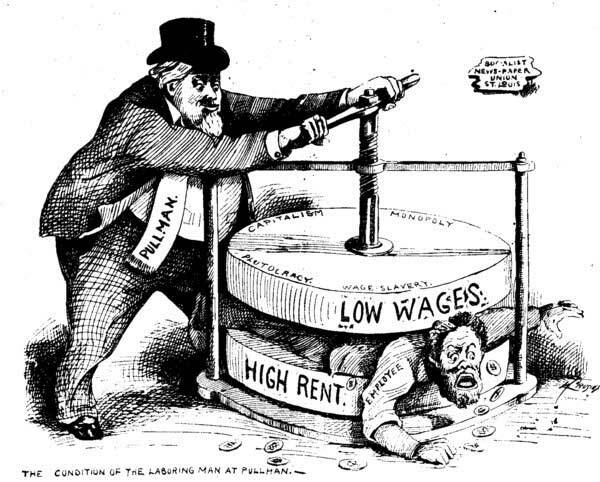 The Gilded Age, a term coined by Mark Twain to describe a society in which all was not as perfect as it seemed, occurred in the United States in the late 1800's. The era saw a radical shift in American culture as the economy transformed from an agrarian to industrial society. Marked by corruption and greed, the Gilded Age was also a time of reform. It also marked the entrance of the United States into the global market. After the conclusion of the Civil War, the United States had to come to grips with new social and political realities caused by the abolition of slavery and the integration of free African Americans on a large scale. For information about the Reconstruction and the presidencies from Lincoln to Hayes, visit The Reconstruction. The turbulence of the Reconstruction was a harbinger of the political turmoil to come. Garfield's assassination at the hands of Charles Guiteau inadvertently led to political reform. Prior to his death, it was common for political positions to be awarded as a bonus for supporting a particular candidate or official (spoils system, Andrew Jackson). 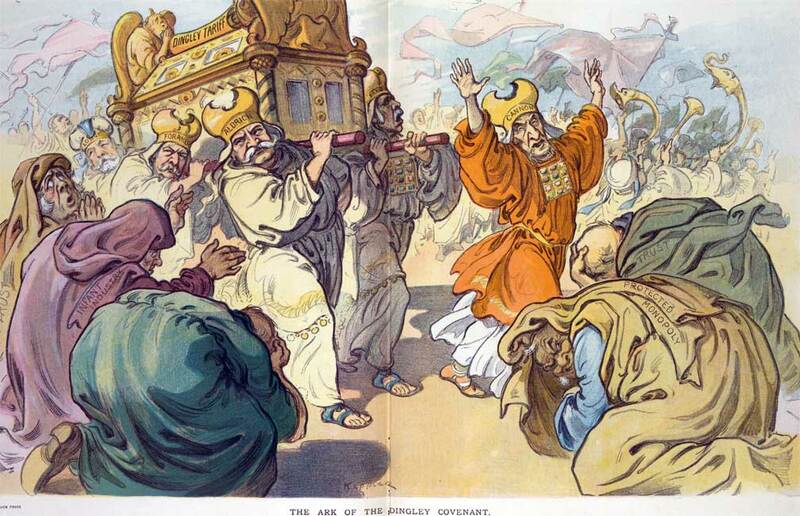 The Pendleton Civil Service Act was passed in 1883 to eliminate the spoils system. It stipulated that government employees should be hired only as a result of merit, and fired only as a consequence of poor work performance. During the time in which Garfield and Arthur occupied the positions of president and vice president, the Republican party was deeply divided over the issue of the spoils system, among other things. The Stalwarts were headed by Senator Roscoe Conkling, and they considered themselves to be traditionalists who were in favor of the quid pro quo system. Prior to Arthur serving as Vice President under Garfield, he had been appointed to the position of Collector of the Port of New York. While in this position, he used his influence to appoint Conkling's supporters to political positions. Eventually, he was removed from office by President Hayes who accused him of corruption. Arthur's addition to the ticket was an attempt to garner the support of the Stalwart Republicans for Garfield. The Stalwarts favored Ulysses S. Grant running for a third term of office rather than Garfield.Geographically, the majority of Stalwarts came from southern regions, and often espoused positions similar to the Democrats who had the majority of the power there. This led to competition both within and outside of the Republican party. Stalwarts were opposed within the Republican party by the Half-Breeds, political moderates who were in favor of civil service reform. Garfield was a Half-Breed and Arthur was a Stalwart. Nevertheless, after Garfield's assassination, Arthur supported political reform against his own faction's interests. 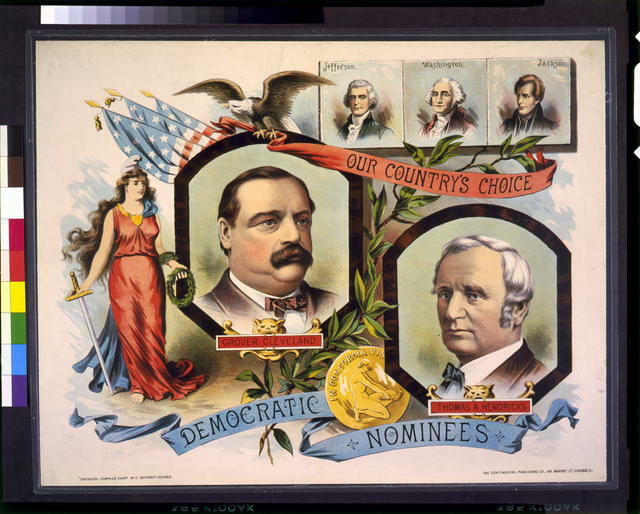 In the election of 1884, the popular Republican senator from Maine, James Blaine, faced off against his Democratic challenger, Grover Cleveland. 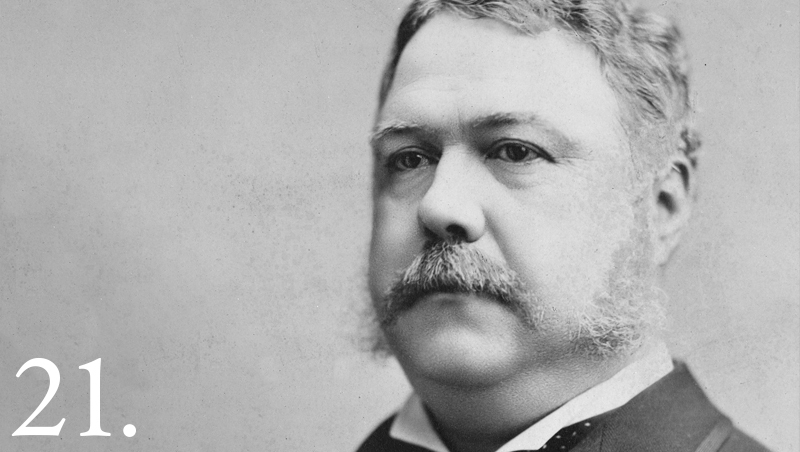 Chester Arthur, despite suffering from the kidney disease which would eventually kill him, cast his lot into the election, but he found no support among his own party. The election was extremely acrimonious, devolving into personal attacks. Cleveland had an illegitimate child whom he not only acknowledged and supported, but his Republican opponents used that fact to raise questions about his character. The Republican candidate, on the other hand, had engaged in underhanded business dealings with the implication being that he had used his office to profit. 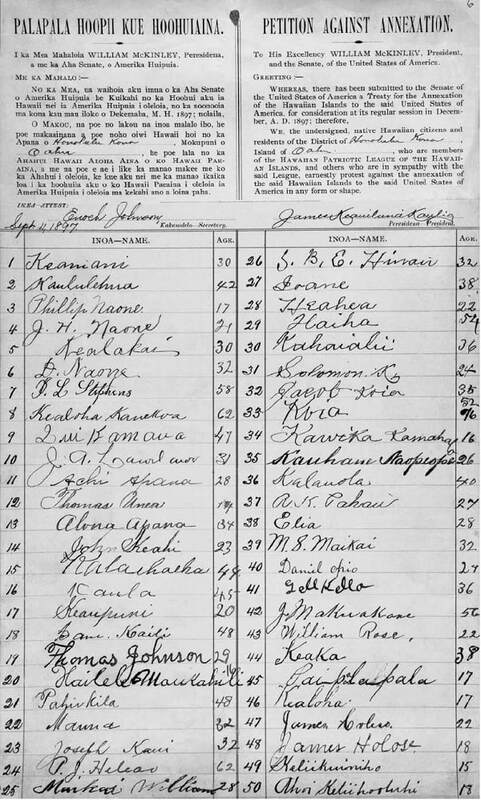 The race was too close to measure until toward the end of the campaign trail, Blaine became associated with bigotry against immigrants and lost their support. The belief that Blaine was corrupt caused an enormous amount of dissension in an already factionalized party. Some Republicans felt that they could not, in good conscience, support their party's candidate. These politicians, named by the media as "mugwumps" were seen as party traitors because they openly supported Cleveland for president. 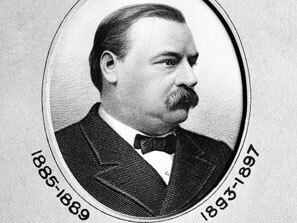 Immediately prior to to Grover Cleveland's second term in office, his wife, Caroline died of tuberculosis. Cleveland's victory, therefore, was more a result of the public concern over high tariffs than it was the result of any stirring campaign promises of his own. Unfortunately for him, the economic policies of the previous administration led to an economic collapse precipitated by the failure of the Reading Railroad (see Panic of 1893 below). Despite the fact that this was the worst economic collapse in the young country's history, Cleveland failed to respond while unemployment skyrocketed to almost 20% nationwide and up to 40% regionally. His laissez faire approach to government was influenced by Social Darwinism and the belief that "fluctuations" were a natural part of the market. Cleveland's second term also marked the first time when federal troops were used to suppress dissent. 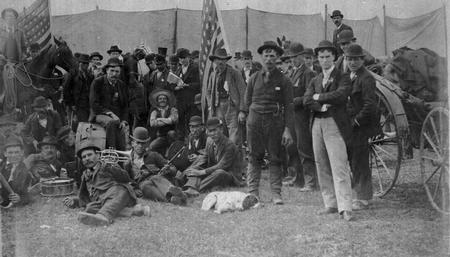 Federal troops were sent in to Pullman, Illinois to stop striking workers at all costs, leading to violence on the part of the workers and the murder of civilians on the part of the troops. Cleveland's social opinions related to foreign policy were far more liberal than his domestic viewpoints. He was opposed to the vote for both women and Blacks, and refused to protect the vote for the latter by addressing racist and exclusionary laws in the south. He saw Blacks as fundamentally inferior, and was opposed to efforts to integrate schools and eliminate cultural boundaries. He adopted a paternalistic attitude toward Native American people, believing that their culture needed to be destroyed in order for them to move forward. 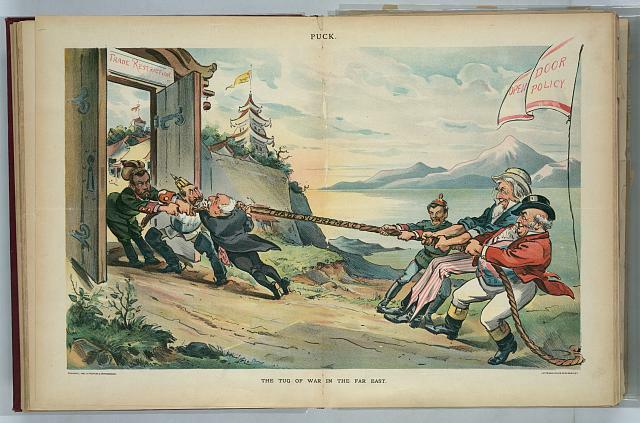 Cleveland's position on Chinese immigrants was a bit more complex. 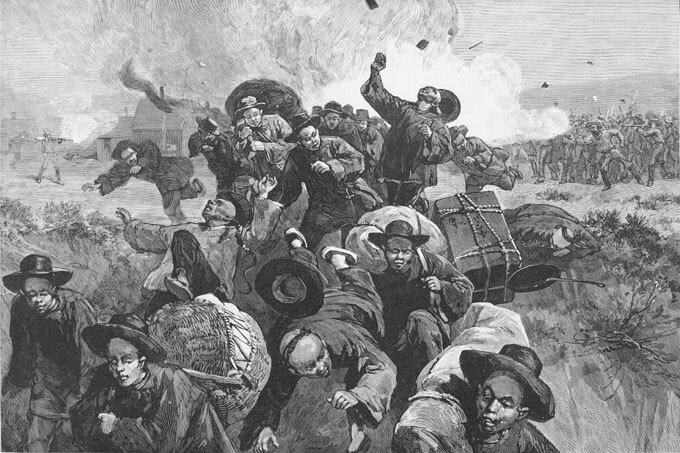 Initially, he expressed outrage and horror at the atrocities committed against Chinese immigrants. 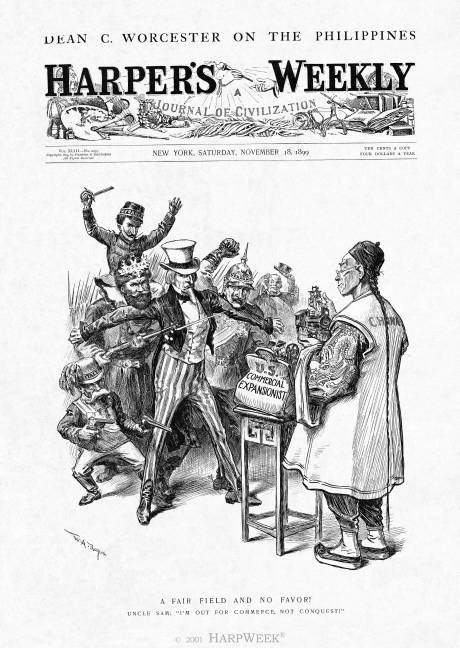 Nevertheless, he eventually came to the conclusion that the Chinese culture was incompatible with US culture and signed the Scott Act of 1888 into law. 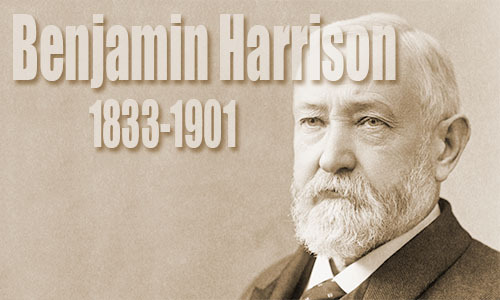 When Benjamin Harrison was elected to office, restoring the Republican dynasty, many saw it as a mandate from the American people to enact economic reforms. Harrison, although politically savvy and generally forward thinking for his era, was not a personable man. As a result, support for him and his policies was often lukewarm. He failed to win reelection after his 4 year term. The McKinley Tariff Act and the Sherman Silver Act were quid pro quo legislation which had a profound impact on the US economy. Harrison was a protectionist who believed that the only way to preserve the economy was to place exorbitant fees on imports. To ensure support for the imposition of tariffs, Harrison negotiated with western representatives and agreed to support a silver standard for the US economy that would benefit the western silver mines. EQ What is populism? What were the roots of the Populist Party? What was the goal of the Populist Party? Why would farmers want inflation to develop? 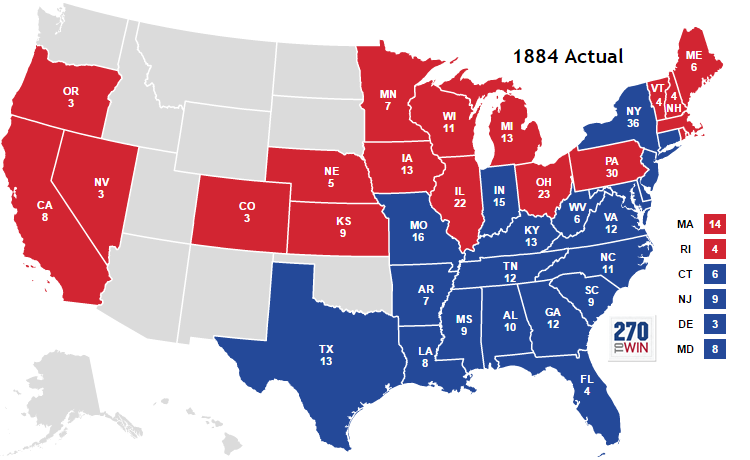 The election of 1888 saw the Republicans gain control of both the House and the Senate, and this new unilateral control removed any obstruction to the economic policies enacted under Harrison. Called the "Billion Dollar Congress," the legislature approved a variety of spending increases. 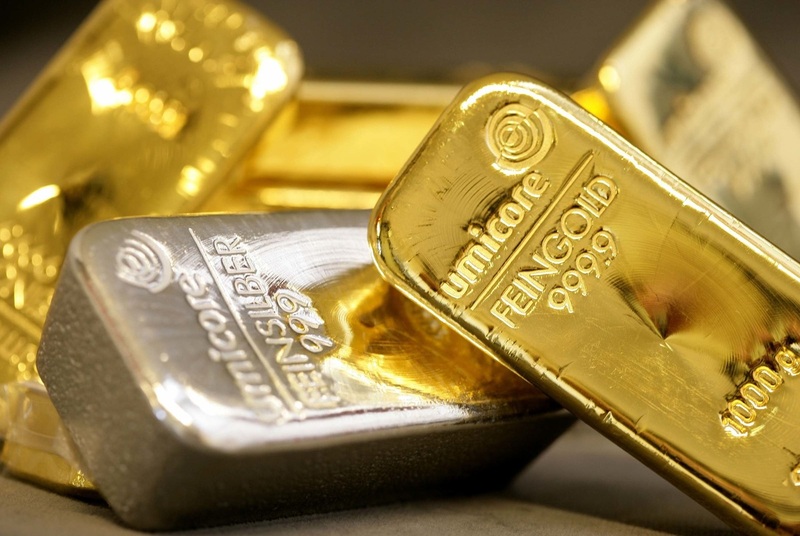 This plus the disastrous Silver Act depleted the nation's gold reserves and led to a period of economic depression. McKinley's presidency marked a transition in american politics not only into a new century, but also into a new era of progressive politics. He was also the last of the Civil War veterans to serve as president. McKinley hailed from Ohio, and had served as governor there. 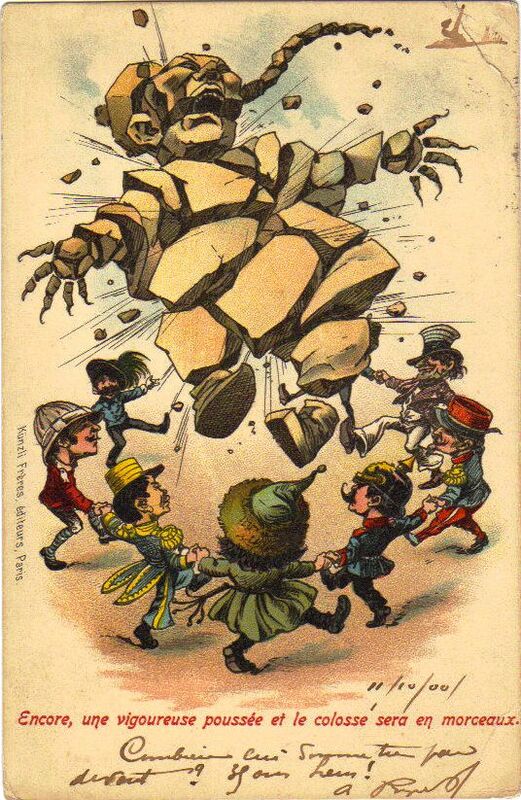 Ironically, he was elected to the office of the presidency in large part because of the panic of 1893, which his own policy of protectionist tarrifs had helped to create. His presidency was dominated by foreign concerns and saw the US expand through annexation and foreign conflict. McKinley was re-elected in 1900, but was assassinated a few days after his inauguration by a disgruntled, self-proclaimed anarchist named Leon Czolgosz. 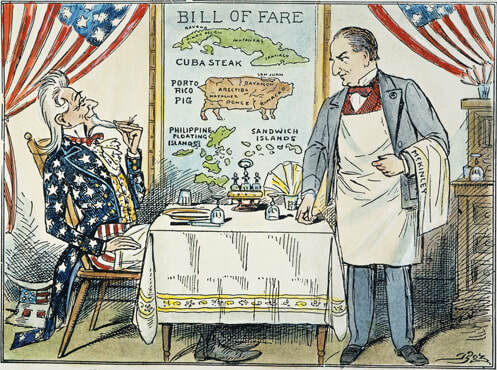 In 1895, Cuba sought independence from Spain. Spain responded with extreme brutality, stirring American sympathies for the rebels involved in the uprising. In 1898, The US Battleship, USS Maine, exploded while docked in the Havana harbor killing 260 military personnel. Journalists Randolph Hearst and Joseph Pulitzer stoked the flames of public outrage, and the situation escalated until, 2 months later, Spain declared war on the US. The US government followed suit and declared war on Spain one day later. The US dominated battles on both land and sea, and future president Theodore Roosevelt joined the fray leading his volunteer army, The Rough Riders, into the fray. More American troops died of disease than the war itself. Spain consented to a peace treaty in December of that year, and the US acquired Guam, the Philippines and Puerto Rico as territories. Cuba acquired its independence. SOURCE: "A Fair Field and No Favor!" (artist: W.A. 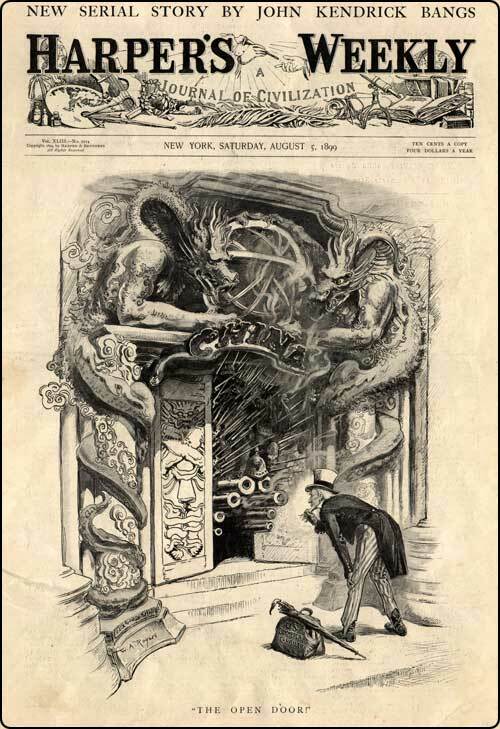 Rogers), Harper’s Weekly, 18 November 1899; Collection of P.P. Choy. By the end of the 19th century, European powers and Japan had begun to carve China into their own spheres of interest. 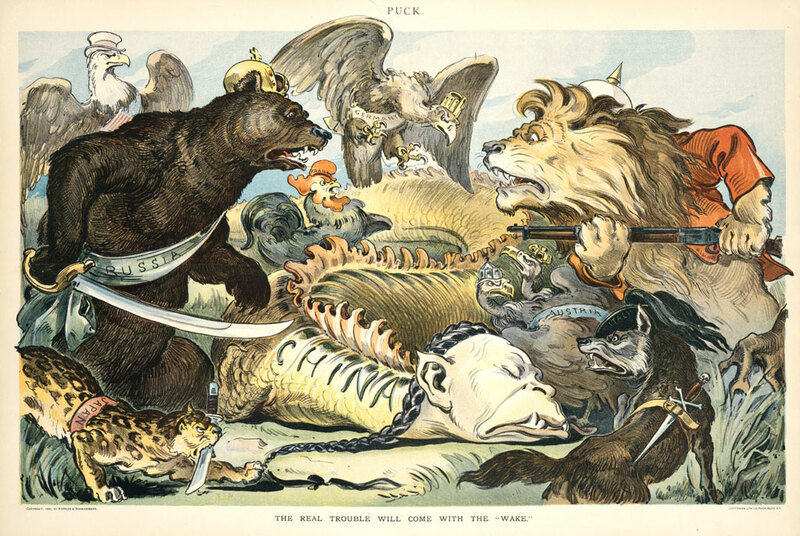 In 1899, fearing the United States would be shut out from expanding their trade opportunities, U.S. Secretary of State John Hay urged that all nations be given equal trading and commercial access to China. This became known as the "Open Door" policy. Though U.S. correspondence regarding such a policy was transmitted to the other nations, China was not officially notified of this position. Northwestern Litho. 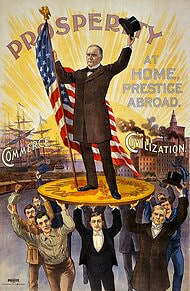 Co./Library of CongressPresident William McKinley showed his support for the gold standard in this campaign poster. Note the gold coin on which he stands.